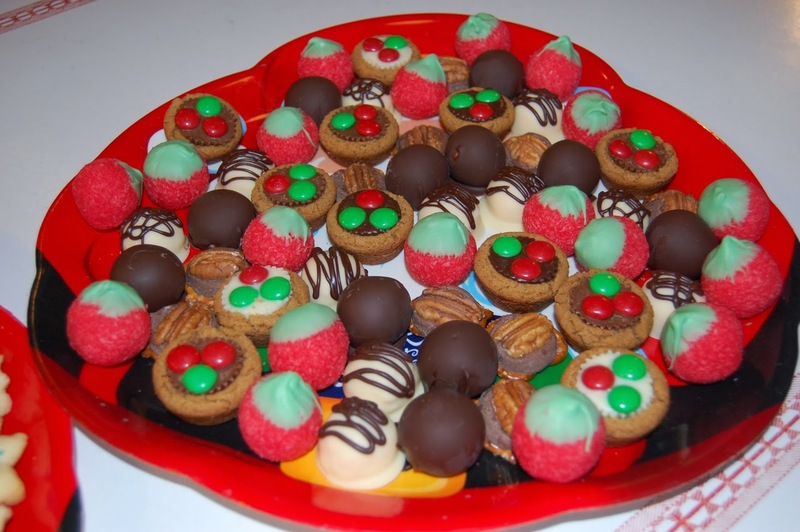 This year was the first year in many years that I made several types of treats for Christmas. I'm not sure where I got the crazy idea to bake all these cookies, but it was fun (and crazy). The kids helped as much as they could, especially with taste testing and decorating. I gave cookies to the kids' teachers, brought a plate of treats to the Dairy Star, delivered cookie plates to some of our friends and neighbors, and brought three trays of treats to my extended family's Christmas gathering. All the craziness was worth it when my sister said, after our Christmas gathering was over, that having a table full of treats helped make it feel like Christmas. This is the recipe I got from Glen's mom. They turned out great. And I accidentally came up with the best recipe for frosting them. I'll share it soon. Here's the recipe. This is the first time I've ever attempted to make spritz cookies. I used my grandmother's recipe and they tasted just like the ones I remember my dad and mom making. 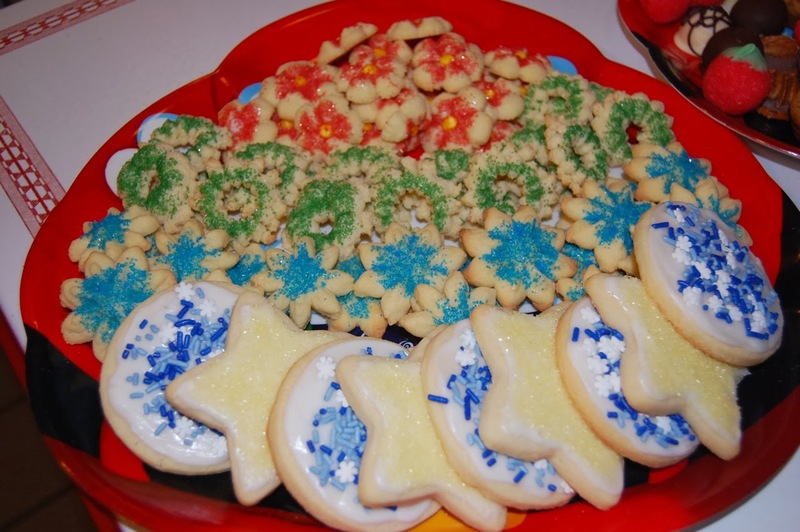 When the first pan of cookies came out of the oven, I was overcome with emotion – with both pride and a connection to a grandma I don't remember. I'll be practicing more next year. These are miniature Reese's Peanut Butter Cups pressed into peanut butter cookies baked in mini-muffin tins. I decorated them with red and green M&Ms. The kids got to help by unwrapping all of the candies. I'm glad they thought it was fun and not child labor. My version of Buckeyes. I dipped them completely in chocolate this year. I tried really hard to dip them in just tempered chocolate, but it didn't work so well, so I added a little coconut oil to the melted chocolate. These little treats are my variation of a treat my grandmother made. She made them as strawberries. Since I love anything and everything raspberry, I tweaked the recipe to make them into raspberries. Plus, shaping them into bon-bons is easier than shaping them into strawberries. My grandmother decorated her strawberries with green frosting; I tinted white chocolate green and dipped the tops of the bon-bons. I experimented with a less sweet version of this recipe. I also left these in the shape of my cookie scoop, dipped them in white chocolate and drizzled them with dark chocolate. After making these this year, I decided I wasn't going to make them again next year. Until, that is, both Dan and Monika declared that these little treats taste just like ice cream and they are their favorite. I guess I'll be making them again next year, but I won't be making a double batch. These have to be one of the quickest and tastiest holiday treats ever dreamed up. I made some of these without the pretzel, too. I definitely need to make more of these next year. Dan and Monika were a great help: they unwrapped all of the Rolos for me. I needed to do something with all the egg whites I had left over from the sugar cookies and spritz cookies. So I decided to try making meringues. I made these once before we started farming and I thought they turned out pretty well. The meringues I made this year were a disaster. They went right in the trash. Next year, I'll try making macaroons with the egg whites. These were on my baking list for Christmas, but I didn't end up making them until New Year's Eve. We decorated them on New Year's Day. I used regular whole wheat flour and they turned out great. Next year I'll try using white whole wheat flour just to see if it makes a difference. I also made Doubletree Hotel Copycat Chocolate Chip Cookies, Kathy's Peanut Butter Chocolate Chip Cookies, and Triple Chocolate Brownie Cookies to give as gifts. After I first finished all of these cookies, I told myself that next year's Christmas cookie list needed to be a bit shorter. Maybe it will be. Or maybe I'll just start baking earlier. It's hard to beat the heartwarming feeling of sharing Christmas cheer with homemade treats.